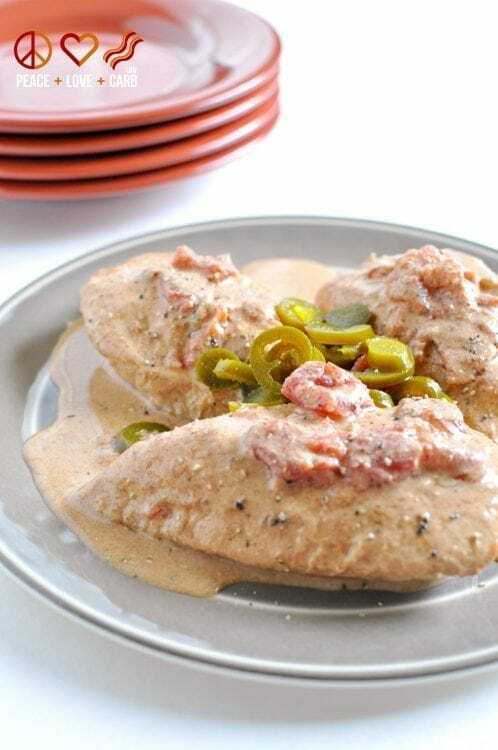 Not only is this chicken dish made with only 5 ingredients, but it is made in the slow cooker. Dinner doesn’t get much easier than that. Looking for some other quick meal ideas? I have a whole section on my site dedicated to recipes with 5 ingredients or less. You can find it – Here. Also, don’t forget to check out my new book – The Primal Low Carb Kitchen – Comfort Food Recipes for the Carb Conscious Cook. To the slow cooker, add the sour cream, chicken stock, diced tomatoes with green chilies and taco seasoning. Mix until all ingredients are well combined. wow! Not happy with someone doing the work of getting the recipe, but have the audacity to complain that there is no nutritional value? Amazing. A lot of people will go out of their way to find something to moan about. People are ridiculous. Made this last night… DELICIOUS and EASY! This is a great recipe that will be part of the regular rotation from now on. Do you carb cycle? If you do, is this a high carb or low carb day recipe? I am just starting carb cycling and am trying to figure it all out. I am looking for recipes and making my shopping list for my trip to the grocery store this morning. Don’t you just love reciepts with like five ingredients?! Sometimes it’s just nice with simplicity :). Thanks for the inspiration, the chicken looks delicious! Any recommendations on a side dish to serve with this chicken?? Jamie, the nutritional analysis is on 90% of the recipes on this website. You say “Who is going to look up every ingredient for every recipe?” Yet that is exactly what you are asking me to do. Websites like fatsecret.com or myfitnesspal.com are great sites for figuring out your macros. I am so happy that you responded the way that you did. I am doing paleo and can tell looking at the recipe whether or not it will work. I believe some people are just lazy and want everything done for them. I hope this helps you. It’s 5g per serving and the recipe says 4-5 servings. I would say it’s 5g per breast! These is my best new find this week, thank you. I have to say it’s hilarious how I see commenters not satisfied alone with the free recipes, pics, ideas, and access – complaining that the calorie counts aren’t included, so ‘they might not try them’. Ladies , you really should love on this stuff, because your next generation family members may not have this type of free unlimited access to anything. How spicy is it? I love all things spicy, but I’m trying to appease my mom as well, who does not. I make this with Rotel diced tomatoes and chiles, and I use the mild to keep it from being too spicy because my kids think everything is too spicy, haha! This sounds so good would like to try this soon. Can a packaged taco seasoning be used? if so how much should I use? I have the same question. Did you get an answer or make a guess when you cooked it? I made this for dinner last night and used 3 pounds of chicken. It was devoured. .
Did you by chance alter the amount of anything, or did you keep everything the same? I have close to 3 pounds and I also purchased a taco spice packet.. any help would be much appreciated. Thanks in advance! I made this today, really yummy! I wonder if I used too much of the taco seasoning, though. I made the entire batch and threw it in, but my final product looks sooo much darker than the picture! Was I just supposed to use a serving like I would have for taco meat? Thanks! 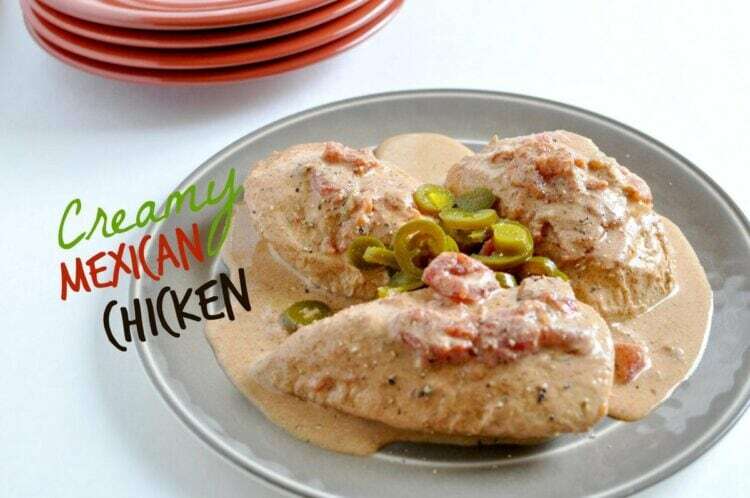 Oh this sounds great, I usually make mine with just salsa and chicken never thought of adding the sour cream can’t wait to make it again now. Do you drain the tomatoes or use the juice? I am sure it is delicious either way!…Thank you for all of your hard work on this website…Your t-shirts are adorable too!! I think it would still be just as good, if not better with chicken thighs. Added bonus that you can usually get them for cheaper too. Win/win! I made this the other day and it is SO good. The first meal we had it over a little rice. It was thin, but perhaps because I used frozen chicken breasts. The taste is marvelous. A little bit of heat to it, but not ‘hot’. I shredded the chicken up for the next meal(there are only 2 of us, so we got several meals out of one batch)and used it in low carb tortillas. SO good! I did use low sodium store bought taco seasoning, and used just a couple of teaspoons. I’ll be making this recipe at least once a month. Thank you Kyndra! So happy you all enjoyed it. Thank you so much for taking the time to come back and let me know. This looks so great and I’m excited to try it! I’ve already made my taco seasoning but I’m a little unclear on how much to use in this recipe. Do I use the entire “making” of the taco seasoning recipe as stated in the chicken recipe or just the 2 TBLs/per pound of meat as noted in the seasoning recipe? Thanks! I haven’t tried this recipe yet but can’t wait to do so! I just wanted to pop on and say how EXTREMELY grateful I am for your site and your willingness to share your recipes with us. I am trying to adopt a lower-carb lifestyle, and as someone who gets easily overwhelmed when it comes to meal planning and cooking, your site is an invaluable resource! Thank you so much! Wondering if it could be cooked on high for less time? Anyone tried? I got started late! What about the sauce curddling ? Any ideas on how to prevent that or reduce that? Thank you for your site and the amazing recipes. I just started on this journey May 27 and have lost 40 pounds effortlessly, in part because of the recipes and inspiration from you.. I will gladly look up nutrional info on every recipe, it helps me understand what I put in my mouth and makes me more accountable. This smelled incredible and the flavors couldn’t be beat! Two large chicken breasts could have cooked in 5 hours on low. I should have mixed all the wet ingredients together as the sour cream would have melted in better. I just plopped it on top and had to stir it around. Mixed in Zanthum Gum to thicken. Probably wouldn’t add the chicken broth next time. A definite winner!! !